Most people first pick a recipe, and then find an appropriate wine pairing. But I often go the other way around. I find a great wine (or have a craving for a specific type of wine) and then find a dish that complements it. This time around the wine was a 25 year old vintage port: Graham’s 1991 Vintage Port. Vintage port is typically paired with either cheese (usually blue cheeses like Stilton) or chocolate. We decided to go the chocolate route. While I have a few amazing chocolate cakes in my repertoire, I felt like something different. But something that would nicely showcase chocolate. This chocolate tart was a winner. And very simple to make. The tart crust is pressed into the tart shell (rather than being rolled), which makes it super easy. You then prepare the ganache filling while the crust bakes. You don’t let the crust cool, but add the warm chocolate filling as soon as the shell comes out of the oven, and then bake it again with the filling until it sets. 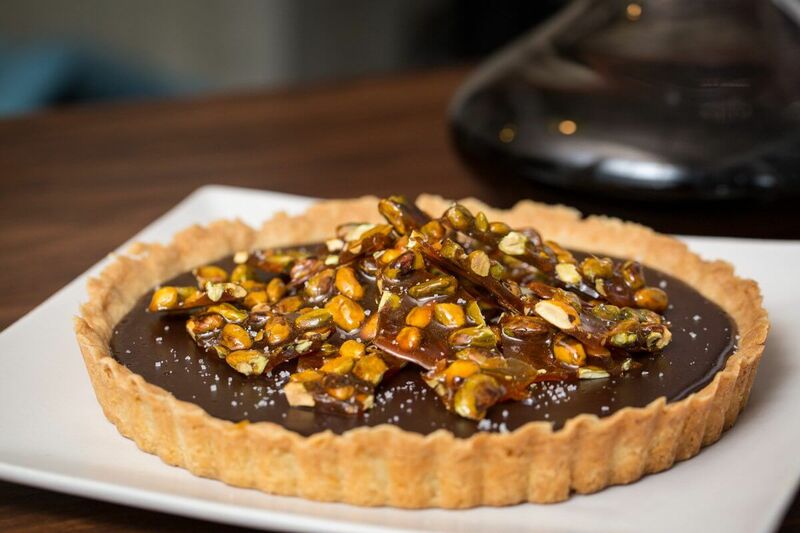 The tart is topped with a salted pistachio caramel brittle (that can be made the day before). I sprinkled the entire tart with some additional flour de sel before serving.